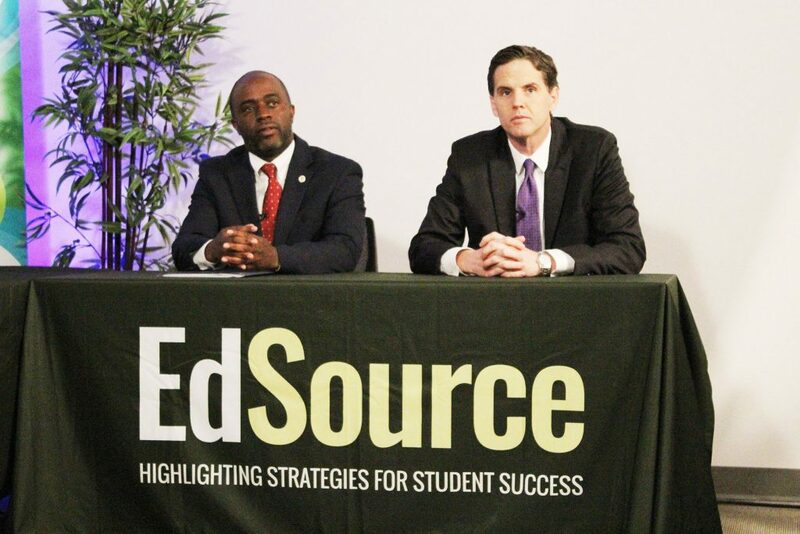 State superintendent candidates Tony Thurmond, left, and Marshall Tuck at an EdSource-sponsored conversation in May 2018 in Oakland. Donations supporting education executive Marshall Tuck in the race for state superintendent of public instruction continue to outpace those backing Bay Area Assemblyman Tony Thurmond. Independent committees supporting Tuck have raised $20.4 million as of Monday compared to $7 million by a committee supporting Thurmond. Likewise, Tuck is ahead in direct contributions to his campaign, having raised $4.2 million compared to Thurmond’s $2.8 million, as of the most recent campaign finance filing deadline Sept. 22. Thurmond is a former social worker, school board member and council member in Richmond. Tuck is the former president of Green Dot Public Schools, a charter school organization based in Los Angeles, and CEO of the Partnership for Los Angeles Schools, a district-city initiative that runs 18 district schools. Most recently he’s worked for a nonprofit to develop effective teachers and principals. As early voting ballots are mailed to California voters this week, record levels of funding continue to pour into the contest primarily from advocates of charter school expansion who favor Tuck and organized labor groups backing Thurmond. Independent committees that support the candidates combined to raise almost $12 million in the last three weeks alone, with Tuck’s supporters accounting for the vast majority of that money. California voters can expect to hear a lot about the state superintendent race on television and online in the weeks before Election Day on Nov. 6. Campaign finance records show supporters of Thurmond and Tuck are spending millions of dollars on advertisements to sway voters in this nonpartisan contest, which appears below more high-profile races for governor and U.S. Senate on the November ballot. Both men are Democrats who say California must spend substantially more money on education. They are seeking a four-year term in an office that, despite its lofty title and role leading the California Department of Education, has limited authority over local school districts or charter schools. The state superintendent earns a $175,182 annual salary. Campaign finance records show Students, Parents and Teachers Supporting Marshall Tuck spent $8.1 million on television ads as of the most recent campaign finance filing deadline on Sept. 22. The committee also spent $4.4 million on mail, radio and Internet advertising. Individuals are limited to contributions to campaigns of $7,300 per election which means $14,600 over the primary and general election. There are no limits on the size of donations to independent expenditure committees, known as IECs. The groups are separate from Tuck and Thurmond’s campaigns and are barred from coordinating their efforts with candidates. The committee supporting Thurmond, which has attracted support from unions representing teachers, university faculty and other school employees, raised $2.1 million over the last three weeks. That committee — Educators Supporting Tony Thurmond for Superintendent Of Public Instruction 2018, Sponsored by Teachers and School Employee Organizations — spent $4.4 million on television advertisements as of Sept. 22 and another $362,000 on web ads. While less money has flowed directly to the Tuck and Thurmond campaigns, the fundraising totals are still record-breaking in the race for state superintendent. The $2.8 million Thurmond’s campaign raised in direct contributions as of Sept. 22 surpassed what Superintendent Tom Torlakson raised in direct contributions through his entire re-election campaign four years ago, $2.5 million. Tuck’s campaign long ago topped the $2.6 million his campaign raised when he challenged Torlakson unsuccessfully in 2014. What Democrat receives millions of dollars from Republicans? Tuck has the same privatizers Villaraigosa had which will be devastating for public education supporters. Don’t be fooled! Our choice? Tweedle Dum or Tweedle Dee! Either one is a schmoozer beholden to benefactors first willing to throw thimbles of water on the conflagration of K-12 education! As John Walker notes, they will actually be carrying water for the unelected State Board members, who will be eternally grateful for their obeisance!